Having bugs in the home is something of a nuisance. First there’s that irritating sound that they make as they buzz around your head. Then there’s the fact that they make the place feel untidy and dirty. But what’s worse if the decided to give you a little nip! Just as important is what having pests in your home means for your health and hygiene. Imagine dipping a hair in a pile of cow manure and then dipping that same hair into your drink. Would you then be happy to go ahead and drink that drink? Most of us would say not… And yet that’s exactly what’s happening if you have flies, cockroaches, or other insects in your home. And that’s before you even consider what rodents and larger critters can do to your home. Unfortunately, spraying around toxins isn’t a great idea in the kitchen. And rattraps just don’t always do the trick, and are messy to boot. This is where ultrasonic pest repellers, such as these from Aspectek, come in and can offer a great deal of help. This product review is for Aspectek’s pack of four ultrasonic pest repellers. These can be placed at four different locations around the home, and will help remove pests and prevent infestations by providing an ultrasonic sound that is inaudible to humans but is unbearable for most pests. This is a completely safe and hygienic way to keep your home pest free, and in this case, you’re also getting those benefits in a compact black and green design, with very easy installation. These four ultrasonic repellers work by plugging into a mains power supply, which means you don’t need to worry about batteries or other forms of maintenance. In fact, Aspectek promises that these pest and insect repellers are 100% maintenance free and to back that up, they come with a very impressive life-time guarantee. What also puts this product ahead of the competition is a 180 degree rotation ability, that allows you to direct the noise directly to the site of infestation. A single device should be able to cover an area up to 5,000 sq. ft.
Ultrasonic wave products can be somewhat varied when it comes to effectiveness, which makes it particularly important to be careful when making a choice and when reading customer reviews. This product in particular scores very highly however and right now has an average score of 4.9 stars out of over 261 reviews. Reviews report that the products really do work, and don’t cause any upset for pets either. Meanwhile, one of the only negative reviews is a little concerned that the product may not work that well on carpeted floors. There is no mention of this in the product description however. If you do have the option though, use this in rooms with wooden or stone floors as this is likely to give better results. With all this in mind, this product comes highly recommended for anyone that is dealing with pests around the home or that wants to prevent a possible future infestation. As an affordable, non-toxic, and effective means of improving the hygiene of your home, these are a great purchase and something that many more people should look into. Buy an alternative ultrasonic pest control product with a UK Plug on Amazon.co.uk using this link. 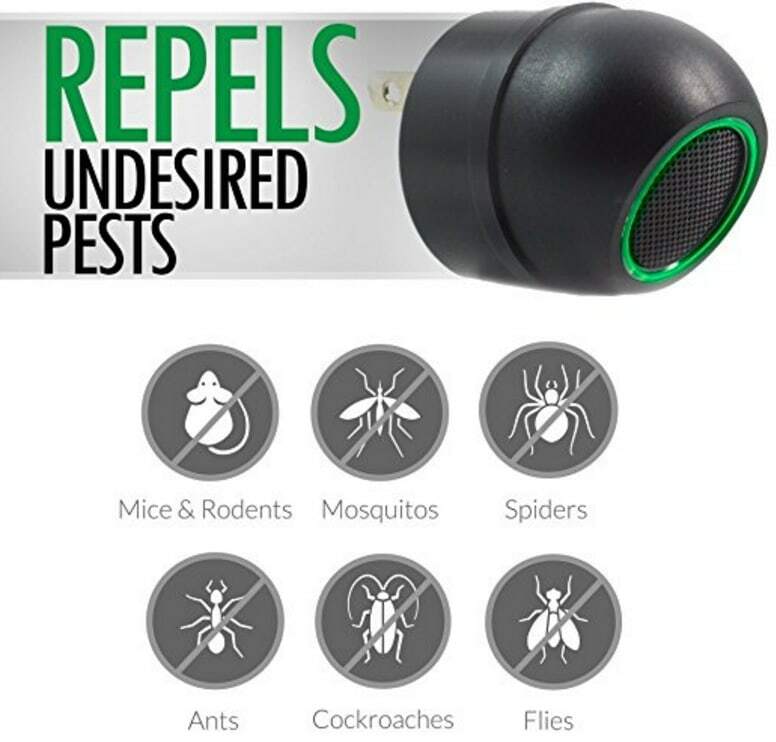 We hope that you will find this Ultrasonic Pest Repeller Plug-in Review of great use if you are thinking of making a purchase online.